While I have done some cruising in the Bay of Fundy previously, I had never crossed the Bay. There isn't any good reason to be apprehensive about this type of trip, since it isn't any more complicated than going up the coast, but the sheer distance offshore was a daunting thought for me and I was nervous. We planned to do the crossing on Saturday, July 26th and come back on July 29th. Since we had some schedule restrictions, and because of the tide times, we had to traverse the Falls on Friday and stay at Market Slip until Saturday morning. 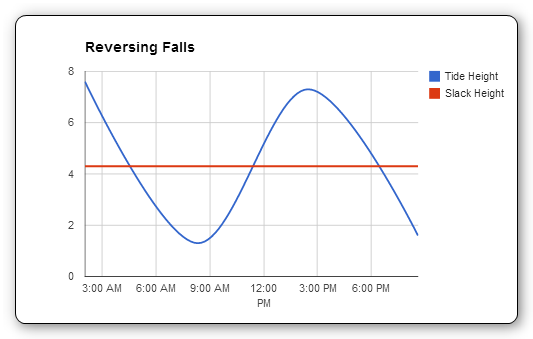 We traversed the Reversing Falls on Friday afternoon at 2:15pm. Side note, I have since written a letter to the mayor of Saint John to plead for improvements to this slip. It could be such a great feature! We left Saint John at 6am on Saturday with an estimated travel time of 10 hours. The wind was southerly at 15km/hr and gusting to 25 km/hr. There were a few hours, as we approached Nova Scotia, where the winds came up and gusted to 38km/hr and the seas were higher (maybe 2m). This was a little less comfortable, but still reasonable, and I was able to maintain good boat speed motor/sailing with my #2 genoa and main sails up. As we approached Digby Gut the wind came up more (gusts to 42 km/hr) and I lowered the main entirely. I would have reefed had I had more time before the Gut but it didn't seem worth the effort. My track across the Bay followed a near perfect sign-wave with the tides. We ended up approaching Digby 6Nm NE of Digby Gut. I had originally planned to wait outside of Digby and sail around until the tides were favorable for the Gut, however, since the Bay was getting rough and windy I decided to try making it through the Gut against the tide. Digby Gut has currents of up to 5 knots. We experienced those. We were motor sailing at 6 1/2 knots and it took us almost 1 1/2 hours to get 3.5km through the Gut. The western side of the Gut was wild looking with rollers from the Bay standing up on the outgoing tide flow. I'm glad we were able to stay to the other side! The approach to Digby was easy and uneventful. The Annapolis Basin is beautiful and was a well protected treat after being on the Bay. Digby is a wonderful little town with great facilities. The Royal Western Nova Scotia Yacht Club has a great dock system with full power and water hook-up. Gas is available on the docks as well. A quick call to the dock master got us set up for a stop-in and they were great hosts during our stay. Protection at the club docks is great. There is some noise from the commercial boats but nothing unreasonable. The marina is located right downtown in Digby and allows for easy access to restaurants, treats and supplies. Several marine supply stores are close to the marina. Showers are available a short walk up the road in a municipal building. They are coin operated, clean and well serviced. If you need more supplies there are grocery stores and a hardware store within a 20 minute walk. Taxis are also available in Digby and surrounding area. Annapolis Royal is a wonderful community that can be reached by sail (2 hours up river) or by transit. Since we had a storm the day of our trip to Annapolis Royal we chose the bus route instead of sailing. the transit system is easy and cheap. Upper Clements Park is a nice place to visit if you have children (or if you like rides yourself). This amusement park is really well layed out, has some fun rides and is reasonably priced. The rollercoaster is a bit of a neck breaker, you've been warned. The flume is great fun! We took a taxi to the park since the transit doesn't run on the weekends. The sail back across was beautiful until approximately 15 Nm offshore when we hit a wall of fog. The rest of the trip was by radar since we had zero visibility. We arrived in Saint John at around 1530 and were well positioned for a 1719 traversal of the Falls after another quick stop at Market Slip. Overall this trip was very enjoyable and I would certainly recommend it to someone who wants to try venturing a little further out into the Bay. Have you done this trip? How was your experience? Comment below! For those of us that don't have a lot of experience going through a significant water feature, like the Reversing Falls, it can be daunting. The first time I went through the Falls I thought I was going to vomit in anticipation! It really isn't that bad though. Once you have done it a couple of times it will be one of least concerning parts of your journey. Twice per tide cycle the level of the river and the level of the bay are equal and allow for a safe traversal for approximately 10-20 minutes. The timing of this slack tide will vary somewhat depending on the level of the river during flooding or low water conditions. I have documented this year's slack tide times here for your reference. If you are unsure about slack times, or want confirmation of the times, Fundy Traffic (on VHF channel 12 will usually confirm times). The Reversing Falls are accessed via The Narrows at the south east end of Grand Bay. This is a ~4 km narrow channel that starts around 45.285376, -66.120209. The channel is easy to navigate but can have a reasonably strong current. If coming from RKYC, a distance of approximately 10km, the travel time (at 5 knots) is approximately 1 hour but you should give yourself some extra time due to currents. The channel from Saint John Harbour to the Falls is well marked and easy to navigate. Market Slip is the normal holding place for those waiting to traverse the falls. From market slip the distance is approximately 2.4km and you should give yourself 1/2 hour to get to the Falls from the Slip. Market Slip is a very nice docking area but you should avoid staying here overnight as it is also very uncomfortable in a southerly swell. On either side of the Falls there are easy staging areas where you can wait for the slack tide. Both are very close to the rapids, so you can see the current water state, but they are calm. The following map shows the general holding areas in green. Once slack has arrived you can enter the falls. I would keep a reasonable speed (4-5kn) through the rapids since there is still a lot of turbulence. Watch for debris and logs in the rapids as they tend to get caught in the whirlpools and eddies. You should review the cruising guides for more information on traversing the falls safely. There is some information in the cruising books about the Reversing Falls but not a lot of information online.I would appreciate comments from experienced sailors in the area so that I can add to this reference and make it as useful as possible for newbies. Please comment below or email me with suggestions for useful information.